После продолжительной разработки и нескольких beta- и rc- релизов увидела свет новая версия свободной RTS Warzone2100. Основные изменения по сравнению с веткой 2. * (последней версией в ней была больше не поддерживаемая 2.3.9), а также предыдущими релизами лежат в области графики и сетевой игры. How long had I been waiting for this to commence - every month, every week, every day passed so painfully slowly - it seemed like eternity. I sometimes felt like a little kid imagining weird things - imagining being in some limbo land where the clock just wouldn’t tick any further. And finally it happened on the 26th of November, 2012. The Google Code-in ‘rocket’ had launched from the lands of the ‘Google empire’ to many thousand homes where young developers were ready to explore the world of Open Source in the next 50 days of their life. I am one of those students. I’m not exaggerating - seriously. I’m just giving voice to the feelings of hundreds of teenagers who participated in Google Code-in 2012. After contributing to KDE in GCI ‘11, I was determined that this year I would be doing the same. Thankfully I got this opportunity and I grabbed it with both hands! Возможность получить и модифицировать несколько css свойств за один вызов функции .css(). Добавлен source map — файл соответствия минифицированного исходного текста библиотеки исходному, для облегчения отладки. Данная версия является последней, поддерживающей старые версии Internet Explorer, IE6, IE7 и IE8. Код версии 2.0, выпущенной в виде бета-версии уже очищен от их поддержки. Поддержка версии 1.9 продолжится и после выхода 2.0, однако в ней будут только исправляться обнаруженные ошибки. I had grown tired of the look of the system meter plasmoids in my desktop. I was looking for a more minimalistic yet complete system information. 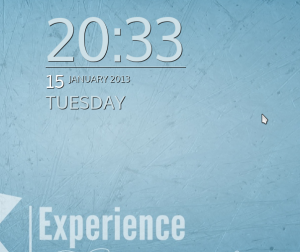 Browsing around, I came across several desktop screenshots with Conky and KDE, and I liked them. Previously, I had the idea that it was suited only for Gnome, but these screenshots changed my mind. So I got to the task of finding a suitable configuration to replace my current plasmoids and some blink in the process. First, I wanted a big clock. I had come across several examples with a big clock on the desktop, and I liked that. This is what I came up with. "Linux phone platforms Ubuntu and Sailfish could move closer together along with Plasma Active from KDE, as the groups behind them are talking about using common Application Programming Interfaces in their work on User Interface design. QML component API's to come together? The #active channel on irc.freenode.net is a place where people from a wide variety of projects that use various common bits of technology hang out. In Plasma Active we do a lot of work with Qt, QML and Mer, for instance; so we have people there from the Mer project as well as various QML focused projects. Yesterday was therefore "just another day at the office" for us as a conversation between a Jolla (Sailfish) developer and a Canonical (Ubuntu Phone) developer about QML component API started up in the Plasma Active irc channel. Not only was everyone "Ok" with this, but consensus was that it was pretty awesome that we have a space for people to come together like this. People even said that to each other rather than let it remain silently unsaid. Contrast that with the attitude we sometimes see in development communities that discourage such "off-topic" communication between "competitors". Вчера состоялся официальный запуск портала VM Depot, который представляет собой репозиторий образов виртуальных машин на базе открытых ОС (в первую очередь Linux), готовых для развертывания в облаке Windows Azure. Hi all, this is my first 2013 post. My last post was 5 months ago because I did finish my studies (I'll graduate on March) and I had to do some work so I had no time to blog about Arch or the KDE projects in which I'd like to join (stay tuned!). packages for Arch? Do you need any help with those? Andrea: There's no real hurry about that. hurry to put qt5 in [extra] IMHO. LispWorks Ltd с радостью сообщает о выходе версии LispWorks 6.1.1 Personal Edition для Windows, Macintosh, Linux, FreeBSD и x86/x64 Solaris. Ядро этой версии LispWorks Personal Edition обновлено до версий Professional и Enterprise Editions. LAS VEGAS, 2013 International CES North Hall, Booth 1837, January 8 QNX Software Systems Limited, a global leader in software platforms for in-car electronics, today announced that Delphi Automotive NYSE: DLPH has chosen the QNX CAR application platform 2.0 for use in next-generation infotainment systems. This week, at CES, Delphi will demonstrate how it has leveraged the HTML5 framework in the QNX CAR application platform to create a powerful graphics system for automotive use. Visit the Delphi booth in the North Hall, 730. American McGee, широко известный по играм Alice, Alice: Madness Returns и Grimm, готовит к выпуску ARPG Akaneiro. Интересная же часть заключается в том, что сейчас идет кампания на кикстартере по сбору средств на портирование игры на другие платформы, включая Linux, Android, iOS. Из обещанных плюшек для линуксоидов заявлен дух в виде пингвина, сопровождающего игрока и добавляющего плюшек к здоровью и мане. Кампания продлится до второго февраля и, судя по всему, есть все шансы, что под Linux все-таки появится годная замена дьябло. Кстати, ребята, а я большой фанат Линукса и у меня аж три тачки под убунтой. Мне бы очень хотелось играть в свои же игры и на линуксе. К счастью для всех нас в Unity3D уже добавили поддержку онтопика и мы только что наняли безбашенного прогера из России :). Всё что нам нужно это немного шумихи вокруг проекта чтобы мы знали на сколько это для вас важно. Albert’s item about Okular contributors (a great idea to thank those who contributed their time over the past year — and I’ll say thank you to all the Okular developers who make my document-reading-life a nicer place) and also Seif writing about Mozilla contributions spurred me to quickly hack together a tool to give an idea of the activity in one of KDE’s git repositories. It’s much like the venerable green-blobs graph that Paul Adams makes. It’s just an indicator — I’ve written about this time and time again, the graphs from one repository cannot be compared with other repositories, and the best you can quickly conclude based on these pictures is whether development activity in a repository is carrying on “as usual” or has changed. So here’s a graph of Parley, a small program that is probably considered feature complete. Over the Christmas season we bought an electronic drum kit so that my daughter can practice at home; she’s 9, but I hope that some day we can play “Ace of Spades” together. But the most exciting item in the large box was the empty box! I have not opened it up to ascertain if, indeed, the box is empty. Who knows, it might even contain KDE 4.9.3 packages for FreeBSD. This tutorial shows how to install Ubuntu 12.10 on the btrfs filesystem on a Hetzner server with two hard drives. We see this as a good opportunity for students to learn about open source software, communities and collaboration and for us to find potential future employees (so there’s a great motivation too). We want students not to see their diploma or bachelor thesis as some boring obligation, but rather a “fun” way to learn new things, meet people and gain experience. And last but not least they are potential contributors to the projects they are involved in. There have been many people and companies working on C++11 support in Qt 5. KDAB was involved in several Qt 5 features which relate to C++11. An overview of the features in Qt 5 which relate to C++11 is available from a presentation last Autumn. Представлена новая версия минималистичного оконного менеджера Fluxbox — 1.3.3.
улучшена сборка на платформе Windows. Код Fluxbox написан на языке C++ и распространяется под лицензией MIT. Второго января 2013 года вышло обновление KDE 4.9.5. Всего закрыто 36 проблем. Основные изменения коснулись Dolphin, Konqueror, KDELibs; устранены две проблемы в Plasma, которые приводили к её падению. Исправления в Akonadi, kapptemp, kdepimli, khelpcen, KNode, KsirK, ksmserve, Plasma. Looking past the irony that QML will be available for all platforms but WP8 in the short-term, and Nokias previous involvement in the development of QML, it is nice to see the platforms being created. The last in the row is Ubuntu Phone, others are Jolla’s Sailfish, RIM’s BB10 Cascades, KDE’s Plasma and Nokia’s Components for Harmattan and Symbian. Qt seem to unlock the future UIs for devices. What is striking is the interaction patterns being established. Nokia Swipe, Sailfish as well as Ubuntu Phone seems to rely heavily on swiping from the sides of the screen. This is, in my experience, the key to a truly one-handed device. A variety of methods exist for auditing user activity in UNIX and Linux environments. Компания Canonical сорвала покровы с мобильной версии Ubuntu, которая будет построена на ядре и драйверах Android, но при этом не будет использовать JVM, "используя всю мощь телефона". Она будет поддерживать как ARM, так и x86 процессоры и требовать минимальной адаптации для запуска на существующих Android-платформах. По словам Марка Шаттлворта, лидера Canonical, их цель - создать что-то необычайное, одну платформу для всех типов устройств: от телефонов и планшетных ПК до облаков и супер-компьютеров. Телефоны на собственно Ubuntu обещаны к началу 2014 года, образы платформы разработки будут предоставлены для Galaxy Nexus в течение ближайших нескольких недель. 2012 Recap for me in KDE. As of beginning of December I started contributing to the Mozilla community… I must say amazing people and amazing environment. I was invited by Josh Matthews and David W. Boswell to a Mozillians meeting. The first task I took upon myself was getting new contributors mentioned with every release. With the help of the others I went around pinging people and a couple of days later we reached the consensus that we will be linking to a blog post on http://blog.mozilla.org/community/category/spotlight/ from the release note with every release. We will be using a set of premature scripts I am working on to detect new contributors to a release as well as the contribution rate (code and bugs which is inspired by my GNOME fellow Andre Klapper). Those can be found https://github.com/seiflotfy/mozcctools (nothing special they just spit out JSON stats, will automate them this weekend). Testing with 100k events DB here are some plots, those are peromances of synapse and standard time based queries where the yellow bars are 0.9.5 release and green bars represent “master”. Shorter bars are better. Smaller DB size: With a very small modification to the main table (primary keys), SQlite created some automatic indices that cover what we need so now instead of 34 indices we only need 25. Генерация: 0.235 сек. и 40 запросов к базе данных за 0.117 сек.